Foliage.org: What are the projected dates for Georgia’s peak foliage season? Typically, fall color starts showing in northern Georgia around early-mid October, peaking in late October or even early November. It’s a little too early to predict how vibrant the forest will be this year. Georgia State Park’s Annual Leaf Watch is a great way to keep up with the changing leaves in Georgia. Are there areas, vistas, scenic lookouts or other destinations within Georgia that are known for their uniquely beautiful autumn foliage displays? Lookout Mountain Parkway is a good drive for fall color. There is a great pull over just south of Covenant College where the hang gliders jump off. It’s fun to watch them and take in the color, valley and distant mountain ranges to the west. Dalton, Ga – Praters Mill – the 1855 grist mill is in full operation during the country fair in October. Chickamauga National Military Park is colorful in the fall, and especially nice to visit on a clear sunny fall day. Historic Banning Mills is in a gorge setting, colorful in fall, has historical interpretation and is great for a weekend getaway, romantic or adventure. What are some other popular tourist attractions for autumn travelers to Georgia. What are some of the less well known, but much loved local attractions? Georgia State Parks are popular tourist destinations for autumn travelers. Cloudland Canyon has a hike down to two waterfalls. A new overlook is currently being built for another look into the gorge. Fort Mountain State Park has great hikes, a tower to climb and look out over the valley. Cohutta Spring Conference Center is also a getaway for anyone wanting to vacation in a mountain setting. 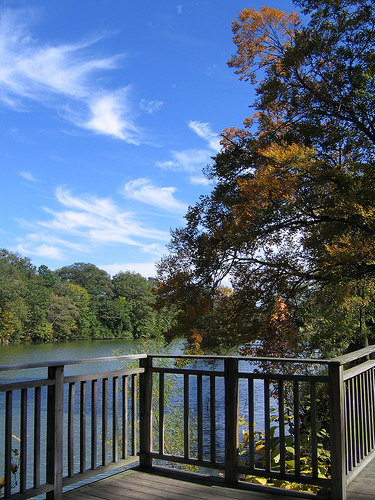 There is a lake for canoeing or rowing and the Cohutta Springs Winery is nearby. Wild Moon Ranch and Resort is a hidden luxury getaway in NW Georgia. It is located in Rising Fawn on Lookout Mountain. Canyon Ridge Club on Lookout Mountain has a getaway package. Picking apples and pumpkins in Ellijay or Blue Ridge. Mercier Orchard in Blue Ridge, Panorama Orchard, Hillcrest Orchard and R and A Orchards in Ellijay; more apple orchards along Apple Alley (GA Hwy 52 east of Ellijay). The best place to find local lodging and dining information is the local Convention and Visitors Bureau or Chamber of Commerce. Is there anything else you would like to tell visitors thinking about traveling to Georgia for the fall foliage season? Georgia’s color is as pretty as you’ll find anywhere! Special thanks to Stefanie Paupeck from Georgia.org for this in-depth response on planning a Northwest Georgia fall foliage trip.